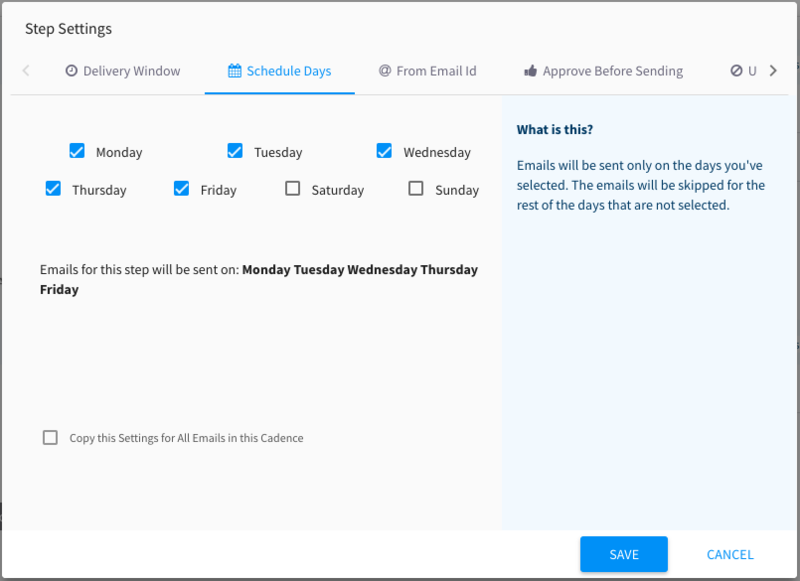 When you use the delivery window and schedule days, emails for the cadence will only be sent during the days/hours you have set. At the end of the delivery window, any remaining emails will be rescheduled to the start of the next delivery window. For example, if your schedule is set 9AM to 5PM, Monday-Friday, emails that are not yet sent at 5PM on Friday will be rescheduled to start sending at 9AM the following Monday. Go to the Steps tab in your cadence. Go to Delivery window to set the hours that the emails will be sent in. 4. Go to Schedule days to set the days that the emails will be sent on and skip the days you don't want emails to be sent. When adding prospects to a cadence, you can select a specific time that the emails should start sending.